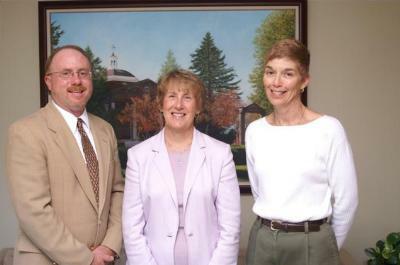 William O’Donnell Lee Advising Award winners Randy Smith (left) and Kay Clapp (right) gather with President Barbara Dixon (center). Kay Clapp, professor of education, and Randy Smith, professor of music, were presented the William O’Donnell Lee Advising Award. Clapp and Smith will each receive a $1,000 development fund to be used for travel to advising conferences or institutes, research materials and other relevant items. All full-time faculty advisers are eligible for the annual award. Truman’s Career Center is having its annual “Graduate School Week” Nov. 14-18. “Graduate School Week” is a series of events designed to show students the opportunities awaiting them after graduation. The University of Missouri will have graduate school representatives on campus from 10:30 a.m.-2:30 p.m., Nov. 14. Representatives from the law school, Truman School of Public Affairs, and Gordon E. Crosby Jr. MBA Program will be at the Violette Hall student counter. Representatives from the biochemistry, genetics, life sciences, fellowship program and division of plant sciences will be available in Magruder Hall outside of room 2030. The Career Center is having a Walk-In Graduate School Assistance event in the Career Center from 2-4 p.m., Nov. 14, and 3-5 p.m., Nov. 17. Students can get help with writing their statement of purpose or strategies for applying to graduate school by stopping in and talking to a graduate school adviser. Donald Asher, a nationally recognized speaker and author, will speak about strategies to gain admission to highly competitive graduate programs. The event is titled “Bound for Graduate School?” and will take place from 5:30-6:30 p.m., Nov. 15, in Violette Hall 1000. An event titled “Show Me the Money” will help students learn how to find funding for graduate school through nationally competitive scholarships, financial aid and departmental funding. Adam Davis, professor of English and interim director of interdisciplinary studies, will present this session from 5:30-6:30 p.m., Nov. 16, in the Student Union Building Governors Room. Missouri State University will have a physical therapy representative available from 10:30 a.m.-2:30 p.m., Nov. 17, on the second floor of Pershing Building. Royce Kallerud, associate professor of English, will conduct an open session titled “Writing the Personal Statement” from 7-8 p.m., Nov. 17, in the Student Union Building Governors Room. He will be available to help students write their graduate school entrance statement. Rockhurst University representatives will be on campus from 10 a.m.-2:30 p.m., Nov. 18, outside of Mainstreet Market to discuss their graduate programs. Representatives will be from their physical therapy, occupational therapy, and communication science and disorders programs. Twelve representatives of the Truman Forensic Union swept most of the top honors in debate and several championship awards in individual events at the Central States Tournament, co-hosted by MCC-Longview (formerly Longview Community College) and Truman, on the Longview campus in Lee’s Summit, Mo., Oct. 28-30. Truman captured the individual team championship in parliamentary debate, as well as both the tournament’s debate sweepstakes and combined debate and individual events sweepstakes championships. This performance placed Truman ahead of several regional players, including William Jewell College, Drury University and Washburn University, as well as schools attending from as far away as Oregon, Oklahoma and Texas. In parliamentary debate Truman cleared 100 percent of its squad, placing a rare six teams in elimination rounds. In the open (or “varsity”) division, the team of Stefani Wittenauer, a junior communication and political science double major from Belleville, Ill. and Sara Archer, a junior pre-business administration and pre-accounting double major from Riverside, Mo., won first place, defeating a team from William Jewell College that is currently ranked third nationally. Close behind them was the team of Elizabeth Hobbs, a senior biology major from Newton, Kan., and Jason Mo, a freshman chemistry major from Chesterfield, Mo., who reached the semifinal round. Additional open division teams reaching elimination rounds were the team of Kevin Haynie, a freshman political science major from Bridgeton, Mo., and Justin Nichols, a freshman from Gladstone, Mo., and Cathy Clark, a senior history major Kansas City, Mo., and freshman Kristel Givogue, a freshman pre-business administration and English double major from Lake St. Louis, Mo. Reaching semifinals in the novice division was the team of Kristen Moore, a freshman political science and philosophy/religion double major from St. Louis, and Casey Sharp, a freshman from St. Joseph, Mo. Quarterfinalists were Jessica Carr, a freshman justice systems major from Park Hills, Mo., and Samuel Cummins, a freshman history major from Collinsville, Ill. Cummins was the top speaker in the novice division, followed by Sharp in fourth and Moore in fifth. In the open division Wittenauer was ranked the third best speaker and Haynie was ranked fourth. Hobbs once again dominated the field for Truman in individual events. In the first half of the tournament Hobbs was the champion in persuasive speaking and ranked fifth in extemporaneous speaking. In the second half of the tournament Hobbs bested this record with a first place finish in both rhetorical criticism and impromptu speaking. She placed second in persuasive speaking as well. These awards confirm her qualification of persuasive speaking to the national tournament in April and bring her closer to the same goal in the other three events. This is the first year Truman has co-hosted the Central States Tournament, sponsoring the Sunday portion of the tournament in individual events. 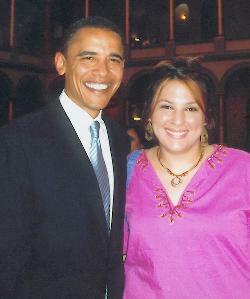 Sarah Saheb (right) stands with Senator Barack Obama (left) at the Rock the Vote Awards Dinner June 8. Saheb received the Rockin’ the Streets award. Obama received the Rock the Nation Award. Sarah Saheb, a communication major from Burbank, Ill., was presented with the Rockin’ the Streets Award at the Rock the Vote Awards Dinner on June 8, in Washington, D.C. The Rockin’ the Streets Award honors a Community Street Team member who has shown dedication to Rock the Vote’s mission and created change in his or her community. Saheb first started working with Rock the Vote in 2001. During the last four years, Saheb has served as Chicago’s first street team leader and led a Rock the Vote chapter on the Truman State University campus. In 2004, she became the Midwest regional street team coordinator managing more than 20 teams, recruiting leaders, and leading her own team. For additional information on the Rock the Vote Awards Dinner, visit http://www.rockthevote.com/rtva05/index.php. The Scholarship Foundation of St. Louis is a non-profit organization that provides access to higher education to St. Louis area students through interest free loans. The program assists students with financial need. Applicants must have a minimum cumulative 2.0 grade point average, demonstrate good character, and must be a permanent resident of St. Louis City, St. Louis County, the Missouri counties of Franklin, Jefferson, Lincoln, St. Charles or Warren, or the Illinois counties of Clinton, Jersey, Madison, Monroe or St. Clair. Call 314.725.7990 or e-mail info@sfstl.org for more information. The Prize in Ethics Essay Contest is an annual competition designed to challenge college students to analyze the urgent ethical issues confronting them in today’s complex world. Full-time juniors and seniors at accredited four-year colleges and universities in the U.S. are welcome to enter the contest and compete for $10,000 in prizes and the opportunity to meet Elie Wiesel in New York City. Entry forms and additional information about the Contest is available on http://www.eliewieselfoundation.org. The postmark deadline for the 2006 Essay Contest is Dec. 9. The Freedom Forum/NCAA Sports is offering scholarships to assist future sports journalism students. This program is designed specifically to assist future sports journalists, while promoting quality sports journalism education at the collegiate level. Eight $3,000 scholarships will be awarded for the 2006-2007 academic year to outstanding sports journalists. Candidates for these awards include only current full-time juniors. To obtain more information about this scholarship, stop by the Truman Financial Aid Office in McClain Hall 103. Deadline for application submission is Dec. 9. The Rocky Mountain Elk Foundation’s Wildlife Leadership Awards program will be awarding up to 10 $2,000 scholarships to outstanding college juniors and seniors studying wildlife sciences. To be eligible for this award students must be an undergraduate in a recognized wildlife program, have junior or senior standing by completion of the spring semester, have at least one semester remaining in their degree program, and schedule to enroll as a full-time student for the following fall. For more information and to obtain and application, visit http://www.rmef.org/pages/scholar.html. Application deadline is March 1. “Shifting Images of Indians and Notions of Race in America”- the emergence of the American romantic notion of Indians and its intersection with developing concepts of race in the North, circa 1790-1900. Demonstration of how stone knives and arrowheads are made. Authentic historical and anthropological presentation on native American culture. Contact Nancy Rediger at 785.7199 for more information. Student Union Building Georgian Room. Select a stimulating conversation of your choice, led by distinguished Truman staff and faculty. Each conversation is limited to eight participants and requires a reservation. You can find a complete list of conversations topics and can make your reservation online at http://rcp.truman.edu/great_conversations.htm. If you have questions, please contact the Residential College Program, Baldwin Hall 101, 785.4409 or rcp@truman.edu. The Department of Public Safety will be providing a shuttle service to the La Plata Amtrak station at 8:30 a.m. Nov. 22-23. •Return pick up will be Nov. 27 at LaPlata train station. •Contact Joyce at 785.4177 Monday through Friday from 8 a.m. until 5 p.m. for more information or to make reservations. Nominations are open for the third annual Student Senate Leadership Excellence scholarship. The scholarship is for two Truman students in the amount of $500 each. All students are eligible excluding all former and current members of Student Senate. Students can be nominated by faculty, staff, administration and students. To nominate a student, send the name and explanation of why the student should be chosen to the Senate Office c/o Chelsea Schinnour or to cbs436@truman.edu. Truman’s United Way campaign surpassed their goal of $52,000 and ended with a total of 103 percent. Matthew Tornatore, associate professor of foreign languages, recently had his article dealing with Cesar Vallejo’s book, “Trilce,” accepted for publication in Texto Critico (University of Veracruz, Mexico). The Truman State University Concert Percussion Ensemble 1, under the direction of Michael Bump, associate professor of music, has been invited to present a feature performance at the Missouri Music Educators National Conference. The performance will take place Jan. 26 in Osage Beach. The Truman Percussion Ensemble is the only such ensemble invited to perform this year, and will mark the second time in four years that the ensemble has performed at the annual conference. Independent adjudicators from around the country determined the performing ensembles based upon submitted performance recordings from the 2004-05 academic year. The ensemble will perform recent works by Julliard composer, Charles B. Griffin, Houston composer Donald Grantham, as well as an arrangement by Bump of Samuel Barber’s Adagio for Strings, op. 11 for marimba choir. SAB is sponsoring a performance by Recycled Percussion at 7 p.m., Nov. 8, in Baldwin Auditorium. For more information, visit http://www.rprocks.com or contact Dawn Runge at 785.4722 or dar834@truman.edu. The Division of Fine Arts will be hosting its Celebrity Benefit Auction beginning at 7 p.m., Nov. 8, at the Kirksville Days Inn. This year the proceeds will benefit the Friends of the Jazz Program. The public is invited to attend and there will be no admission charge. The Days Inn restaurant area will be open if people would like to have dinner prior to the event. The items will be on display beginning at 6 p.m. that day for people to preview prior to the auction. This is the 11th Celebrity Benefit Auction. Proceeds from previous auctions have gone to benefit scholarship funds in art, music, theatre, and the University Art Gallery. This year approximately 156 items will be auctioned off. A listing of the items for sale is available online as a PDF at http://finearts.truman.edu/CelebAuction2005.pdf. The Center for Teaching and Learning Weekly Lunch Series will continue with “Tips for Effective Advertising,”featuring William O’Donnell Lee Award Winners, at 12:30-1:30 p.m., Nov. 9, in the SUB Spanish Room. Call 785.4391 for more information. Pre-Law Club will be hosting the Law School Expo from 11 a.m. until 4 p.m., Nov. 9, in the SUB Activities Room. The Expo will feature up to eight representatives from law schools who will be willing to answer questions for those interested. Informational packets will also be available. The Expo is free and open to all students. For more information contact Ryan Lewis at 314.706.5435. The honor society of Phi Kappa Phi invites all students, faculty, and staff to its annual Fall Gathering from 4:30-5:30 p.m., Nov. 9, in the SUB Alumni Room. This event will feature a student and faculty panel that will provide information to help students get involved in study abroad, internships, undergraduate research, and applying for national competitive scholarships. Phi Kappa Phi students who are graduating in December will also be recognized and refreshments will be served. Stephen Robin, public relations expert in crisis communication, will present “Crash Course in Crisis” at 7 p.m., Nov. 9, in Violette Hall 1010. His presentation will include reflections on his work as adviser to former British Prime Minister Margaret Thatcher. This presentation is sponsored by the Truman Public Relations and Advertising Organization, with funding from the Funds Allotment Council. For additional information contact Elizabeth Sandhu at ens506@truman.edu. The submission deadline for applications for prospective McNair Scholars is Nov. 10. Contact Sarah Hass at 785.5393 for additional information. The Philosophy and Religion Club will be sponsoring a book sale, in conjunction with the Philosophy and Religion conference, that will take place from 10 a.m.-2 p.m., Nov. 10-12, in the Student Union Building. The late David Gruber’s books will be for sale to benefit the Joseph Gruber Scholarship Fund. The Observatory will be open to the public, weather permitting, from 8:30-10:30 p.m., Nov. 10, at the University Farm. Go to http://observatory.truman.edu for more information. The Truman State University Army Reserve Officer Training Program “Bulldog Battalion” will be having a Veteran’s Day Ceremony to honor all veterans of the United States Armed Forces at 11 a.m., Nov. 11, at Reigor Armory. The guest speaker will be Lt. Col. (USAF Retired) Greg Dabney. Refreshments will directly follow the ceremony. The Biology Seminar Series will continue with “An International Scientific and Cultural Experience in Mexico” from 12:30-1:20 p.m., Nov. 11, in Magruder Hall 2050. Brent Buckner, professor of biology at Truman, will be delivering the presentation. “La Fille Bien Gardée” will be performed in French at 8 p.m., Nov. 11-12, in the SUB Activities Room. For more information, contact Patrick Lobert at plobert@truman.edu. The SERVE Center will assist Special Olympics in hosting the Bowl for Gold from 2-5 p.m., Nov. 12, at Leisure World. Students are encouraged to get a team together and bowl three games. Contact the SERVE Center as soon as possible for registration information at 785.7222. The men’s basketball team will take to the home court at 7:30 p.m., Nov. 12, in Pershing Arena in an exhibition game against Dreambuilders, former college players who tour the Midwest. Several former Bulldogs are on the team. That game will be the Bill Cable contest, named after the former Truman sports information director and Truman Hall of Fame member. Donations will be collected at the game for Research & Fight for Parkinson’s Disease. The Child Development Center is sponsoring a Scholastic Book Fair from 9 a.m. until 4 p.m., Nov. 14-15, in the second floor lounge of Violette Hall. For more information, call Katy Korte at 785.4473. The Truman Percussion Ensembles will present their annual “Fall Sampler” concert at 8 p.m., Nov. 14, in Baldwin Auditorium. The performance will be under the direction of associate professor Michael Bump and graduate teaching assistant, Doris Doyon. Featured in this concert will be the Truman Concert Percussion Ensembles I and II, as well as the Truman Statesmen Marching Percussion Ensemble. Approximately 40 students from various disciplines across campus participate annually in the Truman percussion ensembles. Admission is free. The Truman Forensics Union public debate series will continue at 8 p.m., Nov. 15, in the Baldwin Hall Little Theatre. The topic will be “The United States. Should Cease Production and Exportation of Landmines and Sign the United Nations Convention.” The format will be in the National Parliamentary Debate Association (NPDA) style. Students, faculty, staff and members of the Kirksville community are encouraged to attend. SAB presents Trivia Night at 9 p.m., Nov. 17, in the SUB Down Under. Teams of up to five people can compete to win prizes. Admission is free to Truman students. Snacks and drinks will be provided. The Points of Excellence Program has replaced the Hats Off Program. The program can be reached at http://hr.truman.edu/excellence/. The timeline, criteria for selection and nomination forms for the month of November may also be found on this page. Please take a moment to visit the site and recognize a staff member for their personal contribution and significant accomplishments. Questions concerning the Points of Excellence Program may be addressed to any one of the Awards Selection Committee members: Deb Engen, Andrea O’Brien, Erika Sterup, Vicky Wehner, and Curt Devan. The Great American Smokeout is scheduled for Nov. 17. This annual event encourages tobacco users to quite. Ekklesia, the campus ministry for churches of Christ, and Baachus & Gamma will sponsor Turkey Bowling on the brick mall next to the SUB. Using a frozen turkey, participants will attempt to knock down the bowling pins resembling cigarettes. The fun encourages people to defeat the addiction “cold turkey.” The cost for bowling is one cigarette or for non-smokers one quarter. Funds raised will be used to purchase nicotine patches and gum for those seeking to quit in graduated ways. Prizes will be awarded for those who get a “Lucky Strike!” Literature which tackles the addiction from all angles, including spiritual, will be available. For more information contact Dan and Gaylene Green at 627.5003.